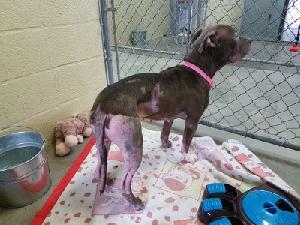 Annie never received the treatment she needed to address her skin infection, which was most likely caused by allergies. At first a skin infection doesn't sound too bad, but it was so itchy and painful that Annie began to self harm in an attempt to relieve herself of the discomfort. Now her skin is raw and an infection has set in. Shy at first, Annie is a sucker for treats and will instantly become your best friend forever if you have one. She loves to cuddle, but until she recovers that is not possible. You can bring cuddles back into her life. You can free her of pain. *Goal includes: surgery, medication, vaccinations, regular health check, and daily care for Annie until she’s ready for adoption. If her medical costs and cost of care is less than is raised in her name, additional funds will provide care for other animals.